The Country House “Nonna Alda” is located in the countryside of Spoleto, beloved by St. Francis, less than 10 km north of Spoleto and only 2 Km from Clitunno spring sources praised by Carducci and Byron, where you can visit the early Middle Age Tempietto – a “World Heritage” site by UNESCO. The splendid Spoleto valley, where the house is located, used to be crossroads of history, crossed over two thousand years ago by Hannibal and then by Augustus, Frederick Barbarossa and Lucrezia Borgia, just to name a few. 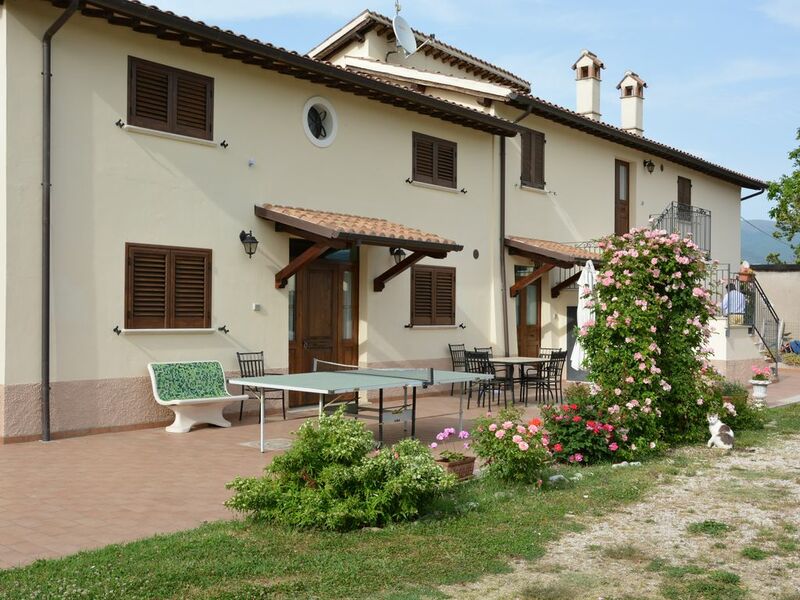 “Nonna Alda”, recently renovated, with a separate entrance, offers up to five beds with a large master bedroom with ensuite, two further bedrooms with shared bathroom and a well-equipped kitchen. Free internet connection with Wi-Fi and satellite TV are available. “Nonna Alda”, surrounded by the typical seasonal crops of Spoleto countryside such as wheat, corn, sunflowers, vegetables, fodder, has a green soccer field with grass in the front yard. You can spend the evening quietly outside the house lapped by the cool breeze while enjoying a barbecue with a nice glass of wine. Next to the house there is a bar/shop that opens early in the morning and closes late at night where you can buy local products, and more to replenish the pantry. A five-minute walk will take you to a pool where you can spend the sunny days of summer and enjoy the wellness center. To complete the offer, close to the property, on foot, you can also spend the evening in one of the two excellent restaurants. I am very happy to offer you this property. I was born here and I can tell you that it is so nice to spend your time here enjoying the nature. The property belongs to my family and has been recently completely refurbished. It is so amazing to relax here, you will surely forget the troubles of the life and you will go back at home completely regenerated. The Country House “Nonna Alda” is located in the countryside of Spoleto, beloved by St. Francis, less than 10 km north of Spoleto and only 2 Km from Clitunno spring sources praised by Carducci and Byron, where you can visit the early Middle Age Tempietto – a “World Heritage” site by UNESCO. The splendid Spoleto valley, where the house is located, used to be crossroads of history, crossed over two thousand years ago by Hannibal and then by Augustus, Frederick Barbarossa and Lucrezia Borgia, just to name a few.